Located on a hillside in rural Rwinkwavu, Rwanda, Share Houses provides 6,900 square feet of temporary housing for medical professionals from Partners In Health and Ministry of Health. Employees of the nonprofit organization and government agency live in Share Houses for as long as one year, as they perform contract work at Rwinkwavu Hospital or attend the hospital’s adjacent training facility. The facility is divided into a pair of single-story bar volumes. In each, eight bedrooms are arranged around a multi-tiered common space to promote community among various healthcare staff. The design elevates the dormitory experience for individual residents through additional means. Bedrooms open to private exterior spaces that boast western views to the Vallée Kibaya. Balconies and other exterior circulation spaces are shaded for comfort in the hot, dry climate. And woven eucalyptus screens provide privacy, while also referencing thatching materials of traditional Rwandan construction. 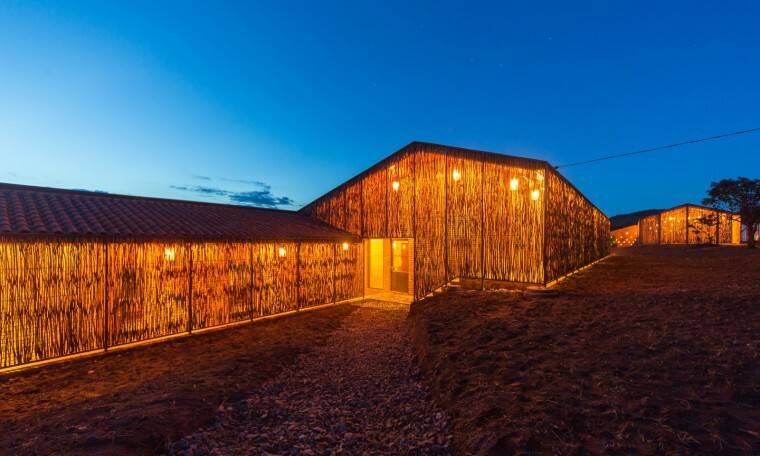 Share Houses’ reliance on regional building materials, such as eucalyptus collected from the area, represents a parallel design response to the clients’ tight budget. Key sources include bricks handmade by a nearby women’s cooperative, locally quarried stone, and the clay tiles that form the project’s ventilated roof cavity. Rwinkwavu residents performed approximately 90 percent of labor, and women represented at least one-third of hires throughout construction. Sharon Davis Design conceived and executed the project in partnership with Rwanda Village Enterprise.